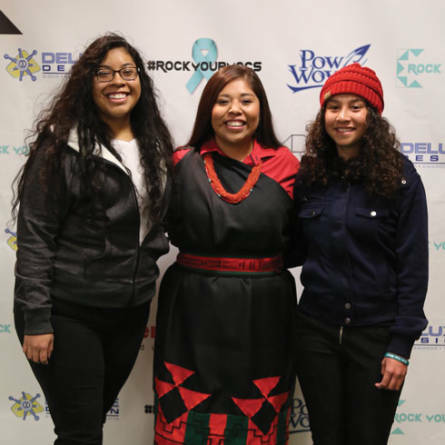 Above: Jaylyn Atsye (center) with two fans during 2015&apos;s Rock Your Mocs event at the Indian Pueblo Cultural Center. Although they remain firmly planted in the realm of honored regalia, in the past few years, moccasins have walked in the mainstream as a symbol of Native American heritage, pride, and unity via Rock Your Mocs, a gathering that, like wearing pink for breast cancer awareness or other similar campaigns, transcends state lines and national boundaries to create cohesion. Since its founding in New Mexico six years ago, the largely online movement has grown to nearly 21,000 Facebook fans. Each year, indigenous people post photos of themselves wearing their tribe’s unique moccasins as they move through the world, walking on the beaches of Hawaii, doing karate in South Dakota, visiting the Leaning Tower of Pisa. While the forthcoming Museum of Indian Arts & Culture exhibit Stepping Out: 10,000 Years of Walking the West (opening next June) will celebrate the history of the footwear, Rock Your Mocs nods to their modernity and ever-evolving indigenous cultures. Albuquerque’s Indian Pueblo Cultural Center will host a celebration on Sunday, November 13, from 11 a.m. to 4 p.m. with a photo wall where visitors can take pictures in their mocs, dances by the White Mountain Apache Crown Dancers, and a moccasin-making demonstration. Rock Your Mocs founder Jessica “Jaylyn” Atsye (Laguna) felt such pride wearing her moccasins—“Moccasins identify who I am. They have a lot of culture in them,” she says—that she wondered why her people wore them only a few days a year. So she created the event via her own Facebook page in 2010, when she was 19. Emergence Productions, a Corrales-based company specializing in Native American and indigenous event production, saw the power of Atsye’s vision, signing on four years ago to grow the social-media presence and establish an in-person event. “Rock Your Mocs had the potential to inspire cultural empowerment at so many different levels,” says Melissa Sanchez (Acoma/Laguna), who heads the company with her husband, Emmett “Shkeme” Garcia (Tamaya/Jemez). Atsye had a lofty vision when she created Rock Your Mocs, but the movement’s empowering effects grew from the root, by helping her maintain sobriety and continue her education. She completed a court-ordered drug treatment program for alcohol and marijuana abuse at 14, and she didn’t graduate from high school with her class. Finding herself the founder of a growing movement, she “wanted to be an example for the younger people. And being a dropout wasn’t the visual I wanted to give them.” She graduated from Albuquerque Job Corps’ educational and career-training program in 2014, and is studying natural resource and fire management with the Trapper Creek, Montana, Job Corps. Six years after founding the event, her core message remains intact. “Rock Your Mocs is about having all our feet on the ground at the same time. If we all come together at the same time, we can do a lot of things. It starts with wearing moccasins,” Atsye says. Although stylish, moccasins aren’t just a fashion statement. The different styles—beaded moccasins from the plains, ruched leather from the Cherokee—represent distinct tribal identities. In most New Mexico pueblos, men wear moccasins with black soles and white uppers that rise just above the ankle. Women wear “wraps,” in which the white leather is wound around their legs just to the knee. (Sometimes the women wear dish towels underneath for comfort; Atsye says when she was younger she wore her softball socks underneath.) There are several variations. For example, at Zia Pueblo, moccasins are made with small “ears” (flaps) at the top. At Acoma Pueblo, men may wear colored moccasins, such as turquoise and and royal bue. Some moccasin cobblers fashion them with customary deer hide, while others use more readily accessible cowhide. Bernard Lewis has learned the intricacies of each tribe’s requirements and the needs of modern-day people. For many years, he was a potter and a regular participant in Santa Fe Indian Market with his tribe’s signature black-and-white pottery. However, a few years ago, he prayed to the Creator for the talent to make something else that could be passed down. He began sewing moccasins, learning mostly by trial and error. He’s becoming a rarity as fewer men of each generation learn the traditional art. Pueblos, such as Pojoaque, are hosting workshops so the craft doesn’t seep through generational cracks, as language, traditional pottery making, and jewelry making for items like bogarts (cuffs worn at dances) are. This fall, the Poeh Cultural Center hosted a workshop for tribal members in the weeks preceding Rock Your Mocs so those without celebratory footwear could make it for the event. Lewis brought the same craftsmanship from his pottery to his moccasins, each of which has more than 300 stitches joining the sole to the upper. Most of his orders are for traditional moccasins for Pueblo dances. However, he says he’s seen orders double and triple in the past few years for low-cut moccasins made for everyday wear. Occasionally, Anglo and Hispanic people purchase the handmade shoes, and he doesn’t mind if moccasins are stepping out from Native culture. “A part of me and my life is with them, walking the ground with Mother Earth,” he says. Lewis’s 13-year-old grandson, from Jemez Pueblo, is stepping into dances as his forebearers have —and he’s following in his grandfather’s footsteps in another way: He’s learning how to make moccasins. Non-Native people are welcome to “join in supporting this initiative and unity among Native peoples,” says Jaylyn Atsye. 1} Style ’em. When Pueblo peoples wear moccasins with traditional regalia, custom dictates style and color. For everyday wear, every type and shade is fair game. Atsye color-coordinates her mocs with her outfits—turquoise mocs with turquoise earrings and jewelry, red mocs with a black dress with red embroidery. 2} Wear ’em low. Custom-made moccasins are indulgently comfortable. Moccasin maker Bernard Lewis, of Acoma Pueblo, says he’s seen orders for low-cut moccasins rise as his customers slip them on with jeans or work attire. Low-cut moccasins, those below the ankle, are the most popular for routine wear. 4} Post, share, and like. Join the social media movement by taking a photo or video of you in your mocs and posting it to Facebook, Twitter, or Instagram on November 15. Use the hashtags #RYM2016, #ROCKURMOCS, and/or #ROCKYOURMOCS. On Facebook, like RockYourMocs to see photos and get the latest event news. 5} Buy local. To support traditional moccasin making, buy from Native artisans such as Bernard Lewis of Acoma Pueblo (505-235-8704) or Albuquerque-based LL Designs lldesignsstore.com.